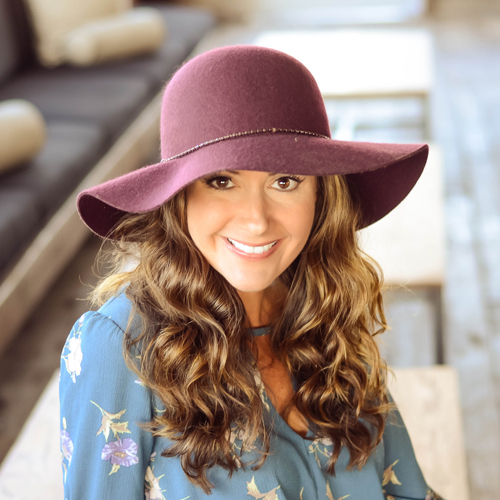 And that’s what I am sharing with you today…the beginning! I totally appreciate those that deck the halls while snacking on their Halloween candy….nothing wrong with extending the festive fun!… but we tend to wait a little longer at our house! After all, Thanksgiving is one of my very favorite days of the year!! 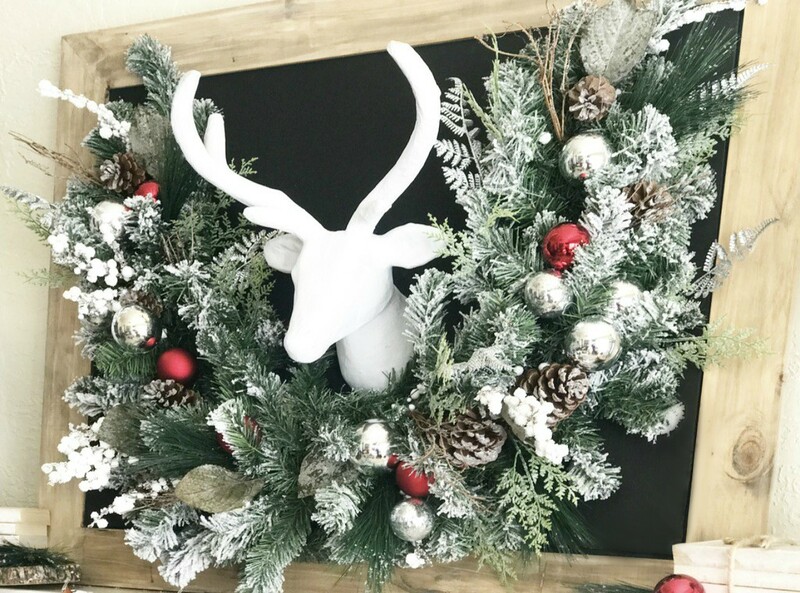 However, when a super talented group of ladies invite you to participate in a Christmas blog hop, you bust out garland and get to work! 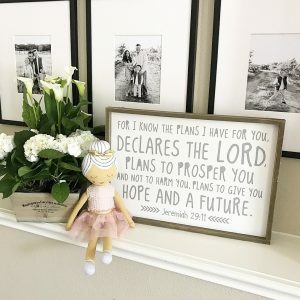 I’m sharing the beginnings of our decorating for this year, but I know you will also gain so much inspiration from their beautiful homes! 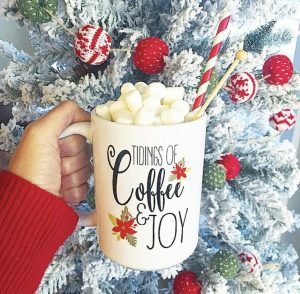 Spreading Christmas cheer, sharing ideas and getting excited for the magical season where we celebrate our Savior is what this hop is all about, so let’s get to it! 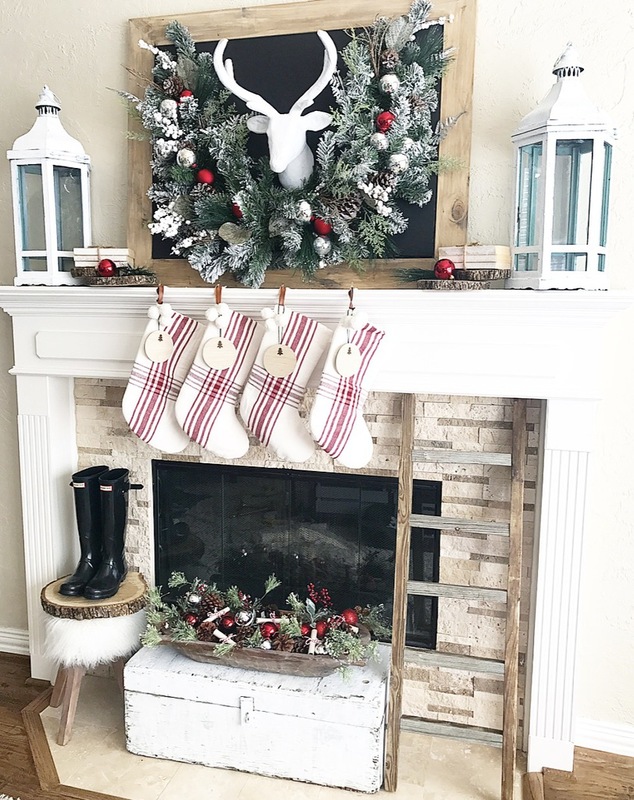 We want to greet Santa with style so the mantel seemed like a great place to start! 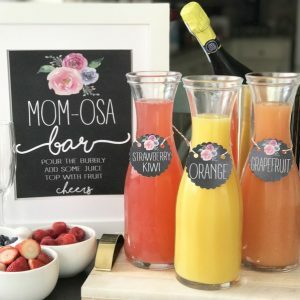 I love the size of this chalkboard I used in my fall mantel, but wanted to keep the artwork on it intact, so I sprayed it with some setting spray and cut heavy black foam board to size. I used a staple gun to attach all the garland and glued the deer head in the center. There are so many fun deer heads out there, but I chose this paper mache one because it is lightweight and was easy to attach to the foam board. I painted it white to stand out against the black. Large lanterns, wood slices, and these little stacks of books surround the chalkboard. These are just paperbacks that I ripped the covers off of and tied with twine. I filled the dough bowl with pinecones, garland, ornaments and some pages from the books scrolled and tied with ribbon. I told my boys they were Santa’s lists! 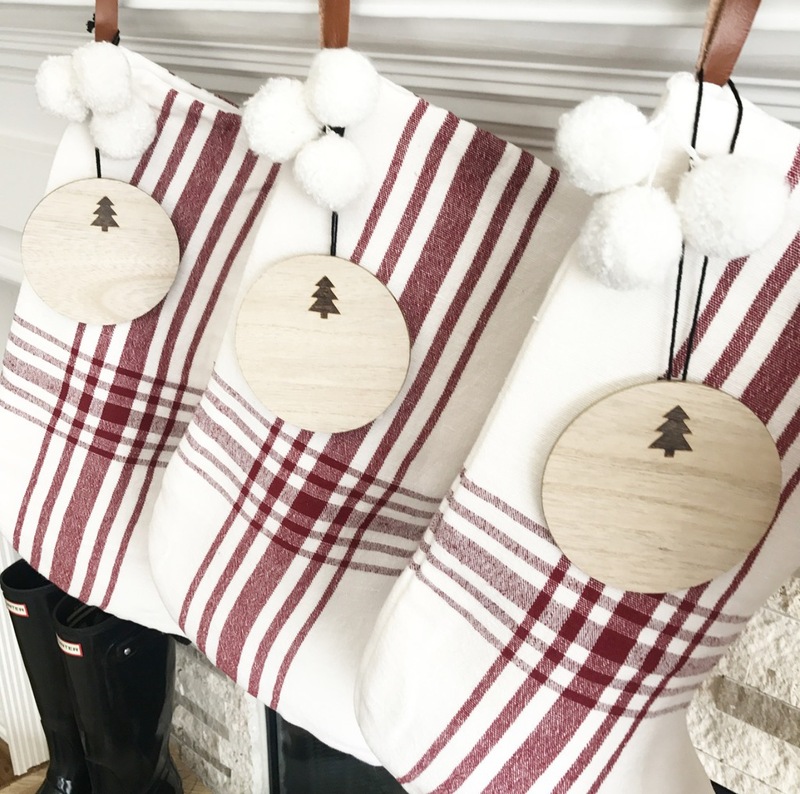 I loved these Hearth and Hand stockings and snagged four of them for our little fam! I attached these coasters from the Target one spot and will be adding each of our names to them soon! I hope Santa approves of our efforts as he shimmies down the chimney Christmas morning! 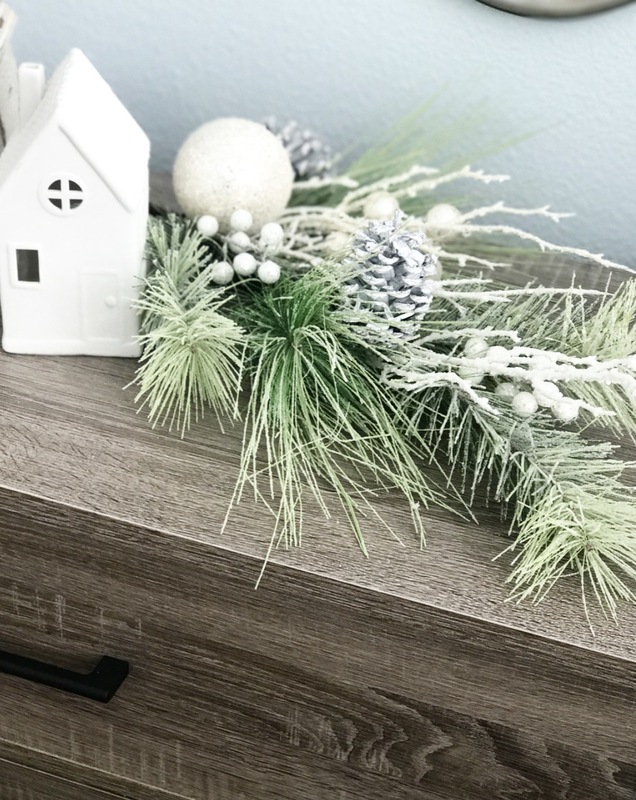 As I shared here, we are re-decorating our master bedroom, so I wanted to add a few Christmas touches this year! Who knows, a flocked tree may find it’s way in here soon…. But for now I added some greenery to each of the nightstands along with these white houses that hold a candle. And this little pillow is a fun reminder! 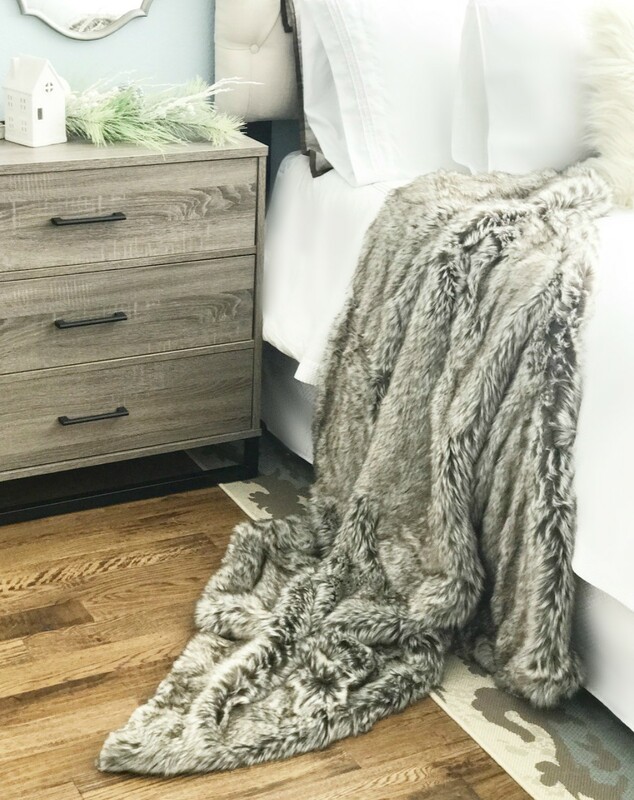 I love adding cozy details like fur pillows, velvet and throws for this time of year! We have a large tree when you first walk in our front door. I loooove real ones, but sadly I am allergic! It took us years of me getting sick every December growing up to figure it out, as my parents have always bought real. This was him last year…. This year I am going to use my hubby’s aunt’s recipe to flock this big guy! I am super excited about it, and will definitely share the recipe and process with you very soon! 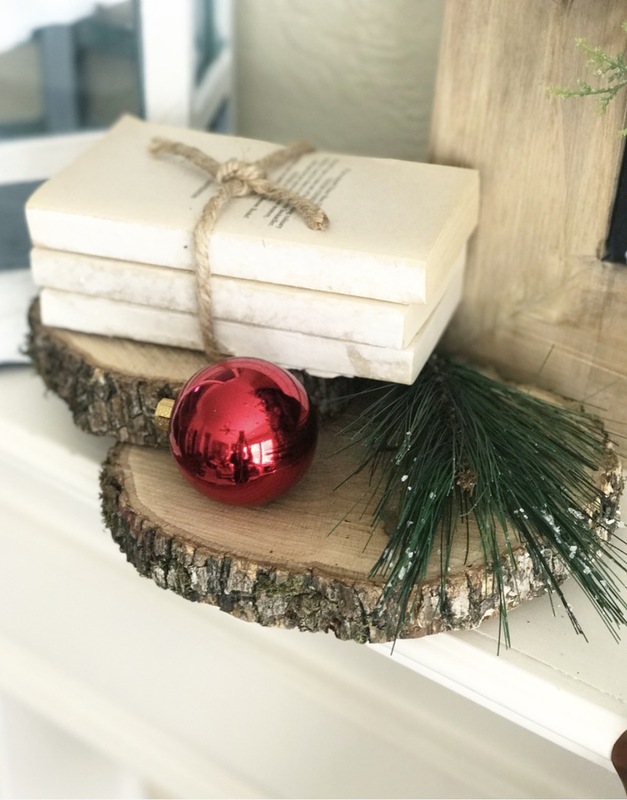 I look forward to sharing more of our Christmas décor and making the most of this holiday season! In the meantime, be sure to stop by all these beautiful homes for inspiration overload! Just click the pic to go directly to their site. Thank you sweet friend! Hope you enjoy your first Christmas as a mama! 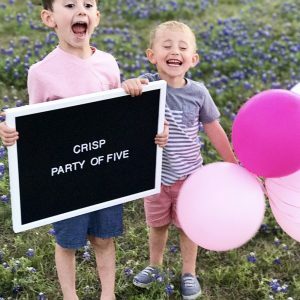 Littles make it even more magical! Thank you so much for stopping by Hope! 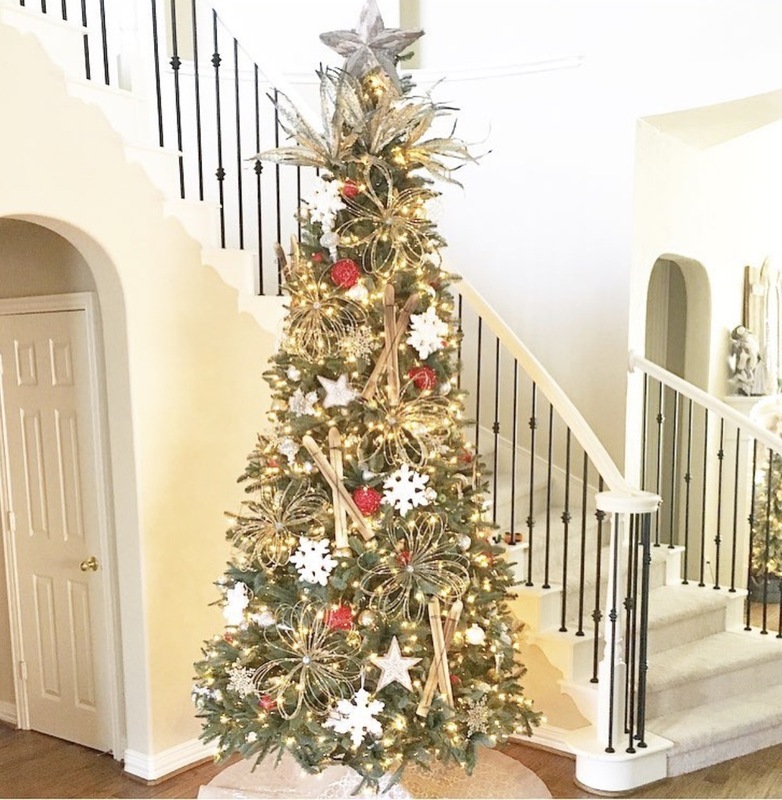 Bethany, your Christmas home tour is gorgeous! 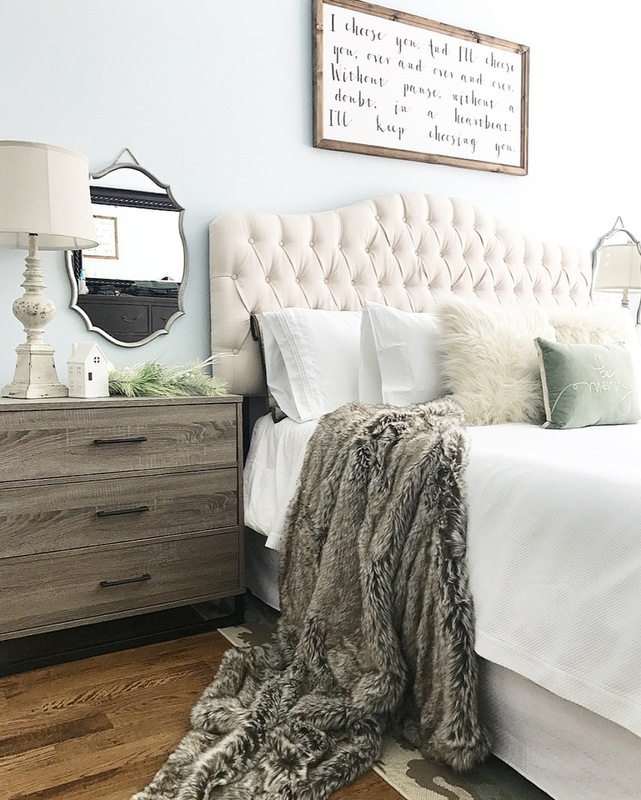 I love your mantel styling and cozy bedroom. 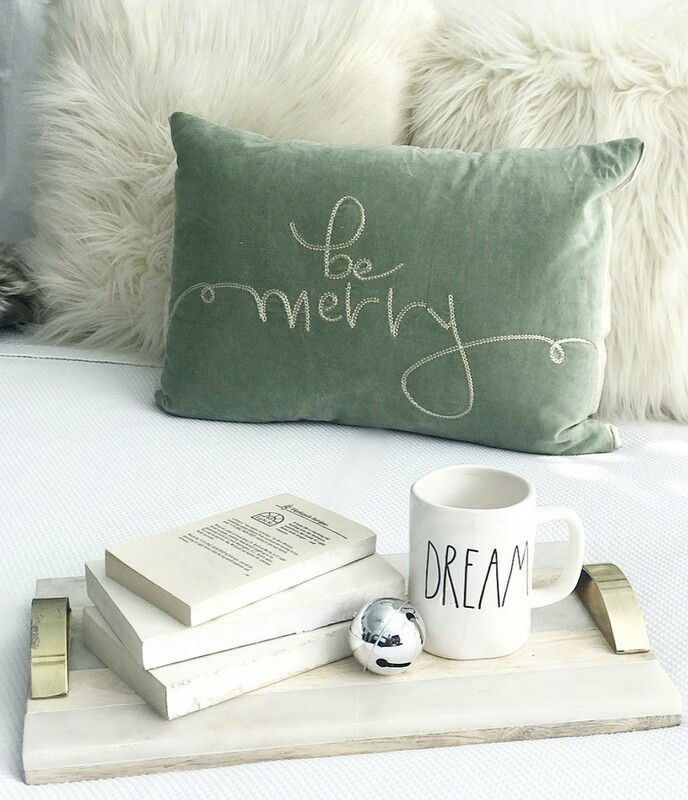 Your decor and styling are filled with inspiration, thank you so much for sharing it with us. Merry Christmas! Thank you sweet Meeghan! You are the best! Bethany, I so loved your home tour!! Excited to see more pops of red in our blog hop! Thank you Randi! You are so kind! Bethany, I absolutely love your Christmas home. It brings so much beautiful inspiration! Your bedroom looks so cozy and inviting, you’ve done an amazing job on it. It’s a true joy to be on this tour with you my friend. Thank you Brendt! You are such an inspiration to me! 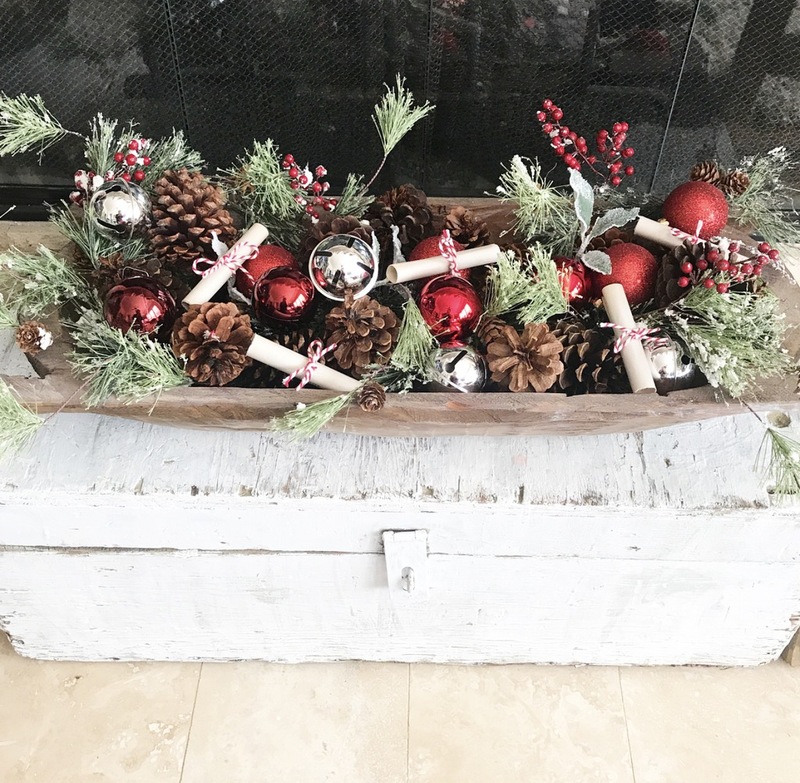 This is such a gorgeous Christmas home tour!! Love all the subtle touches of red. Enjoyed being on this tour with you! I love Christmas and all the decoration related to it. In short I love decorating my place. Recently I bought Salt Lamp and what beautiful addition they are to my home. I thought you would also love to add them at your beautiful home. I bought them from Saltean. Anways, So fun hoppin with you! Thank you so much! I appreciate you stopping by! Wishing you and your family a Merry Christmas!! Hi Bethany, thanks for this home tour. Your home is really very beautiful. Your decorations will definitely be helpful in future to decorate my home. This Christmas I also put some extra effort in decorating my home. This time I used a very unique thing which is Himalayan salt lamps to decorate my living room. And believe me these lamps just changed the whole living room setting. They look so beautiful while glowing. I cannot imagine my home without these lamps. You can get more information about these lamps at http://www.ittefaq.co/ . You are so sweet!! Thank you so much for stopping by!